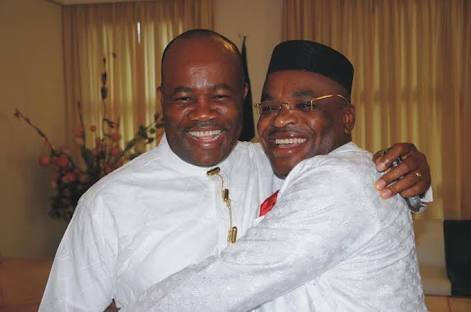 The planned defection of former governor of Akwa Ibom State and Senate Minority Leader, Senator Godswill Akpabio, from the Peoples Democratic Party (PDP) to the ruling All Progressives Congress (APC) has unsettled his successor, Governor Udom Emmanuel and the leadership of the opposition party. Akpabio, a two-term governor of the oil-rich state on the platform of the PDP and senator representing Akwa Ibom North West, met with President Muhammadu Buhari in London yesterday and he is billed to officially declare for APC on Thursday. The president is on a 10-day vacation in London, but his Special Assistant on Prosecution, Okoi Obono- Obla, had disclosed in aFacebook post on Saturday, that Akpabio would be received into APC by Acting President, Yemi Osinbajo and other top leaders of the party at a rally in Ikot Ekpene, Akwa Ibom State. Senior Special Assistant to the President on National Assembly Matters (Senate), Senator Ita Enang, also confirmed Akpabio’s defection move. New Telegraph had, on Monday, July 23, 2018, exclusively reported that Akpabio has concluded plans to dump PDP for APC. The former governor is expected to move to the ruling party with a senator and six members of the House of Representatives from Akwa Ibom State. Akwa Ibom State has nine members in the House of Representatives with eight of them belonging to PDP, while APC has one. Also expected to defect with him are no fewer than 10 members of the state House of Assembly as well as commissioners. Akpabio’s move is said to have unsettled Governor Udom Emmanuel, who practically begged Akwa Ibom PDP stakeholders not to follow the former governor to APC. The governor made the appeal at an emergency meeting of party stakeholders in Government House, Uyo, on Saturday night. At the meeting were 10 representatives from each of the 31 local governments of the state. Emmanuel thanked PDP stakeholders, women and youths for their support and told them not to be weakened with political events unfolding in the state and country. He noted that all PDP presidential aspirants who have visited Akwa Ibom, acknowledged that the state chapter of the party is the most united and organised in the country. The governor appreciated the stakeholders for their steadfastness and loyalty to the party and his administration and informed them that the rebirth the party is undergoing, which, according to him, has placed it on the right track to reclaim power. A lawmaker, who attended the meeting, told our correspondent that core loyalists of the governor appealed to Emmanuel to immediately purge his administration of supporters of the former governor to avoid leaking vital information and strategies to their principal. Among Akpabio’s core loyalists he mentioned is the deputy governor, Obong Moses Ekpo and some commissioners, including Akpabio’s cousin, Ibang. According to the source, Emmanuel told the stakeholders that he did everything possible to please Akpabio, but the former governor could not be satisfied. However, four personal aides to Akpabio were said to have tendered their resignation letters. Their position was made known during a meeting of PDP stakeholders in Abak yesterday. Led by Utibe Nwoko, a Senior Legislative Aide, the senator’s aides dissociated themselves from the planned defection and pledged their unalloyed support for the re-election of Emmanuel in 2019. But, New Telegraph gathered that most political leaders in the state, mostly from Akwa Ibom North West (Ikot Ekpene senatorial district) have concluded plans to move with Akpabio to APC. They include former works commissioner in the state, Don Etim; leader of the state Assembly, Udo Kieran Akpan; former Speaker of the state Assembly and currently member representing Etinan Federal Constituency, Sam Ikon; members representing Abak and Essien Edim/Etim Ekpo/ Ika federal constituencies, Emmanuel Akpan and Emmanuel Ekon; state House of Assembly members, Nse Ntuen, Usoro Akpanusoh, Aniekan Uko, Aniekan Bassey, Idongesit Ntekpere, Uduak Ududoh and Mark Esset, among others. Also said to be on the defection list are the Commissioner for Culture and Tourism, Victor Antai and Commissioner for Labour and Manpower Development, Ibanga Akpabio. The Speaker, State House of Assembly Speaker, Onofiok Luke and Senator Bassey Albert, have defied Akpabio’s request for them to move with him to the APC. One of the likely defectors, who spoke with New Telegraph in Abuja yesterday, said all loyalists of Akpabio were in tune with his decision to join the ruling party. The lawmaker said Akwa Ibom, being one of the leading oil states in the country, cannot afford to be in the opposition for long because it is too strategic to the nation’s economy. His words: “I can confirm to you that five of my colleagues and I with one senator will be joining our leader, Senator Akpabio, to the ruling party, APC.” Meanwhile, a former military governor of Akwa Ibom State, Otuekong Odongesit Nkanga, has urged the governor to prepare for war ahead of 2019 elections. The former military administrator is the Director- General of Governor Emmanuel’s campaign organisation. Also speaking at the meeting, Senator Emmanuel Ibok Essien, who represented Akwa Ibom West in the Senate between 1999 and 2003, assured the governor of the support of the people of the area. “We are the people who have been deciding the electoral outcomes in Ikot Ekpene senatorial district and we are still with you, so there is no cause for alarm,” he said. PDP National Legal Adviser, Emmanuel Enoidem, and a former minister and PDP leader in Eket senatorial district, Chief Nduese Essien, said it is time for Emmanuel’s aides and appointees to go back home and align with stakeholders to work for PDP in the forthcoming elections. Senator Bassey Albert, who spoke on behalf of members of the National Assembly from the state, expressed their delight over the governor’s role in the rebirth of the party and assured him of their support in the forthcoming general election.